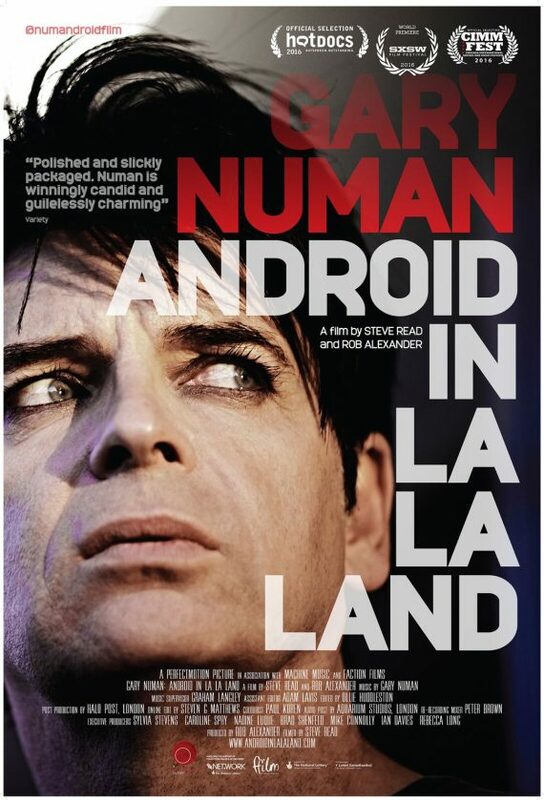 A new film is nigh: Gary Numan: Android in La La Land. It depicts GN – plus wife Gemma, daughters Raven, Persia and Echo, and filmmakers Rob Alexander and Steve Read – on the move. I spoke to one of those fimmakers Steve Read about the film. When did the seed of this film begin? The film happened by chance really… I’d gone to check out Gary’s show at the Hop Farm Festival in 2012 and was blown away by his performance. I wouldn’t have classed myself as a huge Gary Numan fan previous to that, I’d say am I now but then didn’t know that much about Gary, he was completely off my radar. I loved the show and happened to bump into him backstage after the show and got chatting. My directorial debut was about to show on Channel Four and I’d been searching for a subject to work on next… Then I realised I’d found it. I then ran off into the night, his phone number scribbled on my wrist. The next day I spoke to Rob Alexander – co-director – and we agreed to give it a go. We started filming the following week and a lot from that first shoot with Gary appears in the film. He talks about the move to L.A. Living with Aspergers Syndrome, depression, dealing with huge fame and his problem with alienation that huge fame brought, alongside some really hilarious insight into being Gary Numan, that nobody had ever heard before. It wasn’t long before we knew we had the bones of a what could be a great film. What archival footage is used, if any? many will not realise how ‘out there’ GN was in the post punk era… nor how ‘rock & roll’ either as was mainly known for ‘electronic’ music which was only partly the picture. The shape of the film is determined by what the filmmakers have to work with… In our case we didn’t have a huge budget for archive footage which can really stack up cost-wise if used extensively. 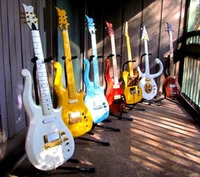 What we did have though, was unbelievable access, as much time with Gary, Gemma and the kids, as we wanted… We followed them on their move to L.A. we’re in the studio with Gary, on tour with the band, living on the tour bus, we even end up going on their family holiday – camping with the Numans. So we ended with an incredibly revealing and intimate film without using a tonne of archive. Of course, you can’t make a film about Gary Numan without ‘Are ‘Friends’ Electric’? and ‘Cars’ somewhere in the film, so we used footage from Top Of The Pops and Gary’s 1981 Wembley shows early on in the film when establishing just how huge Gary was back then. Plus, no doubt they’ll be parts of the audience that won’t know who Gary is, hearing ‘Cars’ will definitely help jog a few memories, it has to be one of the most famous and recognisable songs ever written, even though as you say, it was pretty out there at the time – no conventional song structure, no real chorus, minimalist Moog sounds all combined with Gary’s unique vocal. So what logistic issues did Android In La La Land pose? Mainly trying to be in the right place at the right time… We needed to be there as they arrived and settled into their new lives in L.A. We didn’t want to miss key live shows, or the release of the album into L.A. stores. Touring and filming back in the UK was of course, was a whole lot easier but travelling out to L.A. every few months or so was a huge drain on our budget, the film was also self financed, so we often were faced with tough decisions about what we definitely had to be around for and what we just had to turn down. How does it depict the current climate of music, a portion of which has succumbed to – let’s face it – digital hot air? here aren’t many artist of his vintage out there, making such challenging and contemporary sounding records, he has no interest in recreating ‘Cars’; his only interest is to move forward with each album. Who generally appears in the film? The film stars Gary Numan and Gemma Webb with supporting roles by their three lovely daughters; Raven, Persia and Echo, their dog Wilbur plays also plays a pretty impressive cameo role then there’s Ade Fenton, Splinter producer, Steve Malins Gary’s former manager, Gary’s parents Tony and Beryl Webb and the rest of the band, plus a brief appearance by NIN guitarist Robin Finck, who played a few of the West Coast US shows. The band line-up is as follows: Steve Harris on guitar, Tim Muddiman on guitar and bass, Richard Beasley on drums, David Brooks on keyboards, Tim Slade on bass, Mark Gemini Thwaite on guitar and Frank Zummo on drums. Where can we see it and – let’s be frank – is there a lot of music in it? There’s loads of great music in Android In La La Land, we were fortunate to be able to work with all the stems aswell as all the full tracks from Splinter, Peter Brown our audio mixer, spent eight solid days on Android’s Surround sound mix and has done an amazing job. We always turn it up a couple of notches in cinemas to give the audience the full effect. We want the audience to feel the same energy form the film’s live shows, that I felt when I saw Gary perform at The Hop Farm Festival, the audience are loving the music, a few will no doubt, be humming ‘Cars’ or ‘I Am Dust’, on their way home. Gary Numan: Android In La La Land is in UK & Irish cinemas from 26th August.